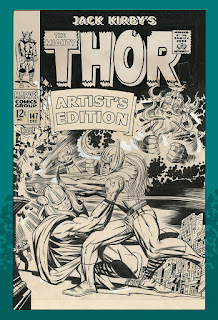 A couple of weeks ago, I mentioned wanting to pick up IDW's Jack Kirby's Thor, Artist's Edition. I was interested in seeing precisely how Vince Colletta went about inking Kirby's pencils, as he had a reputation for erasing figures and simplifying details for the sake of getting his work done more quickly. I mean, to think that readers were getting this Kirby book that had some of his work deliberately removed? What kind of monster would do such a thing?! So I actually picked up the book last week, and have been looking through it. It's probably a good 20% larger than most of the Artist's Edition books (mimicking the size of the original art Kirby was using at the time) so there's a lot of gorgeous detail to take in. 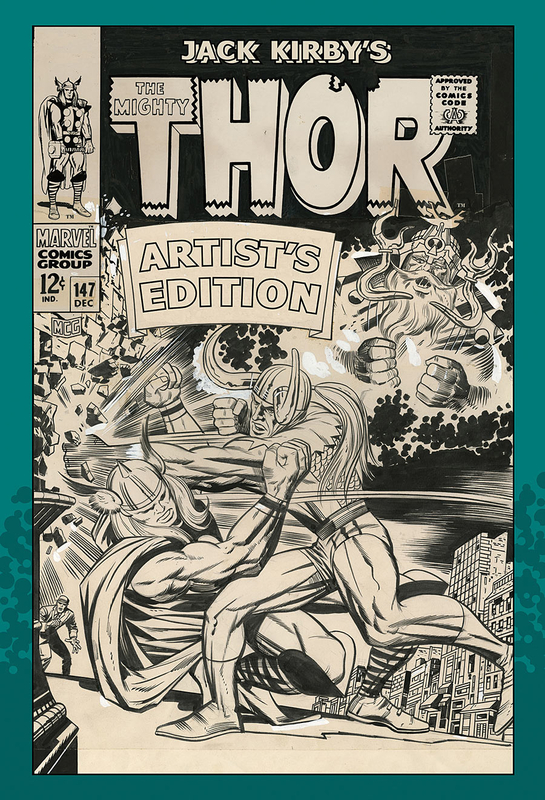 The book includes six complete Thor stories (all by Kirby and Colletta) plus almost another 50 pages of originals from a smattering of random issues. The first thing I noticed is that Colletta was very liberal with white paint. Beyond just the occasional touch-up when he had a stray ink line to cover up, he used white as an artistic element itself, adding in extra highlights or amplifying a Kirby Krackle effect with a secondary, reversed Kirby Krackle on top of the first. Sometimes, in places where Kirby seemed to have laid down some particularly heavy pencils, Colletta would simply paint over them with white rather than bother trying to erase the marks completely. He was very generous with his use of white on the page, moreso than any other inker I've seen. The first instances I noticed where Colletta left part of the art uninked were background elements. None that were critical, by any means, and they were all pieces that butted up against word balloons. 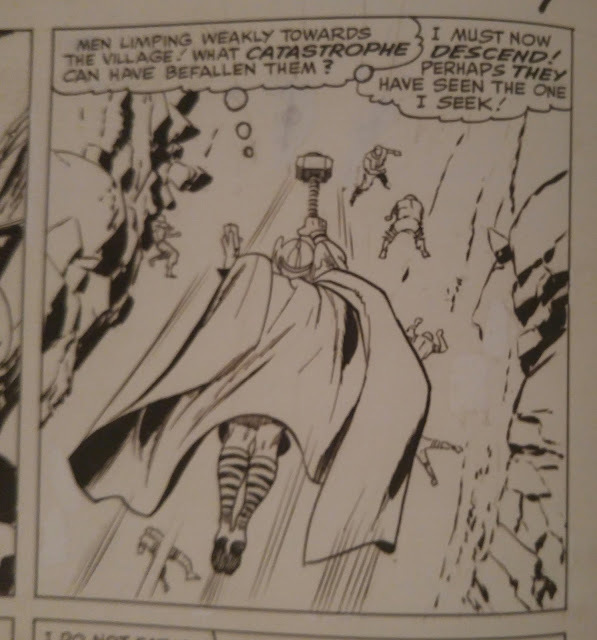 It looked like Kirby had penciled the whole panel, but the lettering took more space than he'd anticipated and, while the balloons didn't completely cover his art, they covered enough that inking what remained would have been somewhat confusing since you couldn't tell what the lines were for. I eventually found a background vase/planter that Colletta had removed in favor of just a straight column. But here again, given the placement near the sole character's head, I could see some justification for the change from a readability perspective. I found a few other incidents like that: where a minor background element was removed or simplified for what could easily be understood to be an attempt to improve reader comprehension. In fact, in the whole of the book, I found exactly one panel where Colletta had removed whole figures and I didn't see how that would improve the panel's readability... If you look closely, you can see that three of the figures have been whited out. One in the lower left, one just to Thor's right, and one underneath the second thought balloon. The one under the thought balloon makes sense, in the same way that some of the deletions I mentioned earlier do. I don't really see a reason why these two other figures, though, would be left out. Their inclusion wouldn't seem to impact legibility at all, and the amount of time inking them -- especially relative to the details on the rest of the page -- seems negligible. But other than that, though, I can't find anywhere where Colletta deliberately left out portions of Kirby's pencils in an effort to seemingly save time. In fact, there are any number of instances where he could have cut some corners in his inking but did not. Large fight scenes with crowds of people, the High Evolutionary's workshop with electronic doodads all over, the filigree on any number of Asgardians... Colletta had plenty of opportunities to skip over Kirby's details, but he elected not to. It seems to me that his reputation has been highly exaggerated. My guess would be that the couple of instances where he did that were teh start of it. Perhaps someone glancing at his art boards without really studying them may have noticed the heavy use of white paint and assumed Colletta was using it to hide Kirby's pencils? Judging from what I see here, though, Colletta's reputation seems highly undeserved. I'm still not fond of Colletta's inking style, personally -- I think a heavier line suits the power behind Kirby's work better; someone like a Joe Sinnott or Mike Royer -- but I don't think Colletta should be maligned as someone who just cranked work out as quickly as possible with no regard to the stories being told. From what I'm seeing, he was actually very concerned with the storytelling, and he was largely working to make sure these were more readable than Kirby had originally drawn them. I got a very negative impression of Vinnie from the internet. I think Fred Hembeck was a big contributor, but probably not alone. I certainly got the same general impression as you, i.e. that "everyone in the know" regarded Colletta as a hack. I have some impression that I've seen a bit of a contrary take in more recent years. Mark Evanier, perhaps? But this straight-to-the-source (or to good facsimiles thereof) evaluation is good stuff, sir. fluid drawing style & to "dull" the shining glean of his ships & machines. This as opposed to the "sparkle" that was apparent when Joe Sinnott did the inks. I like Colletta's work more than a lot of other people, including Kirby himself, who later said he didn't prefer his work (though strangely, had him do lots of Fourth World stuff?).. Like I said, I find this pretty troubling, but I do like Colletta's work despite the many detractors. I appreciate the perspective you point out from the AE book, where he was attempting to serve the story by clearing up confusing backgrounds running up against word balloons. I feel conflicted about modifying the art there, but it does make a lot of sense.